The missile successfully destroyed a ship target, according to the Indian Ministry of Defense. The Indian Air Force (IAF) successfully test fired an air-launched BrahMos-A supersonic cruise missile from a Sukhoi Su-30 MKI multirole air superiority fighter jet on November 22, India’s Ministry of Defense announced in a statement today. The IAF has conducted several tests of the BrahMos-A in 2016 and 2017 ,with two IAF Su-30 MKI fighters converted to launch the new 2.5-ton supersonic air-to-surface cruise missile so far. (A first flight test of a Sukhoi Su-30 MKI with a BrahMos-A took place in June 2016.) Given the size and weight of the BrahMos-A, each Su-30 MKI can only carry one missile in a transport launch canister. In order for the aircraft to carry and fire the heavyweight cruise missile, their undercarriage had to be reinforced, next to a host of other technical modification and upgrades. “The integration on the aircraft was very complex involving mechanical, electrical and software modifications on aircraft,” according to the Indian MoD. “The software development of the aircraft was undertaken by the IAF engineers while the HAL [Hindustan Aeronautics Limited] carried out mechanical and electrical modifications on aircraft,” it added. “One of the major challenges overcome by scientists of RCI [Research Center Imarat], DRDO [Defense Research Development Organization] in the missile development was optimization of transfer alignment of the inertial sensors of the missile.” Transfer alignment is a process to initialize and calibrate a missile’s inertial navigation system by using data from the aircraft’s onboard navigation system to maximize the missile’s accuracy. There is also speculation that the BrahMos-A can be modified into a nuclear-capable missile. 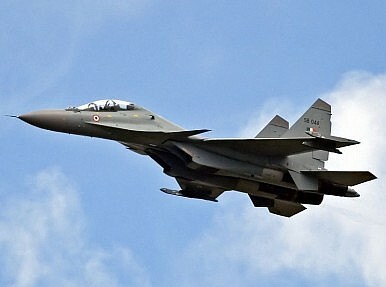 For its future role as the air component of India’s nuclear triad, the Su-30MKIs would need to be retrofitted with hardened electronic circuitry to withstand the electromagnetic pulses of a nuclear blast. The BrahMos is a joint venture between India’s Defense Research Development Organization and Russian rocket design bureau NPO Mashinostroyeniya. The Indian Army and Navy are already operating ground- and naval-launched variants of the cruise missile, which is a derivative of the Russian P-800 Oniks over-the-horizon supersonic anti-ship cruise missile. The IAF will modify 50 Su-30MKI aircraft to carry the nuclear-capable cruise missile. In total, the IAF is expected to receive 200 air-launched BrahMos-As in the coming years, with first deliveries likely to commence in January 2018. The air-launched variant of the BrahMos missile is expected to enter service with the Indian Air Force in 2020.